Filipinos take Christmas celebrations seriously. Months before Christmas, even as early as September, many people start pulling their Christmas trees out of storage and then the holiday decorating begins. 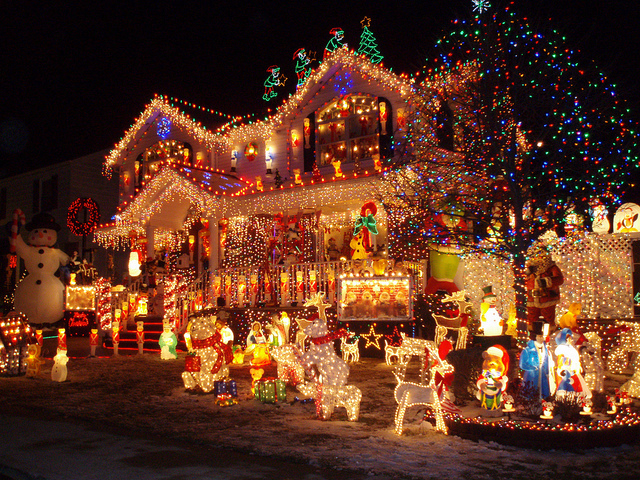 For many Filipinos, the Christmas Season is the only time they redecorate their houses. Birthdays may pass, Easter, Independence Day, Halloween but it is only for Christmas that most Filipinos will express their creativity with Christmas trimmings. Most people rush to department stores to buy Christmas decors, but there are a few uncommon places where you can find good and affordable ornaments. 1. Grocery stores: Big supermarkets and grocery stores often carry Christmas ornaments. Ask for a store assistant’s help if you cannot easily find the aisle where they are. 2. Pharmacy: Believe it or not, big drugstores also carry Christmas items, from decors to wrappers to Christmas gift boxes. 3. Hardware stores: In big hardware stores, you’ll most likely find not just LED light bulbs for your home, but also Christmas lights for your tree. You can even buy the tree itself, or even a wreath, or a nativity set. Do-it-Yourself Network and Real Simple have a few ideas. 5. Candy shop: The bright and colorful kind of candy can make for some good tree hangings. Look for candy canes or Christmas lollipops that you can tie around your tree. 6. Toy store: Small stuffed toys also make great Christmas trimming. Aside from cuddly teddy bears, you will most likely find other toys with a Christmas motif, such as a Snoopy or Hello Kitty doll with a Christmas hat. 7. Paint shop: The usual Christmas colors are red, green, gold, and silver. You can buy spray paint in these colors and use them in your DIY projects. For instance, you can spray paint fallen tree branches or plant pots in Christmas colors and use these in decorating your house. 8. Bookstores: You will most likely find neat Christmas decor in almost any bookstore. You can also buy art materials or a book on holiday decorating. 9. Religious store: For Catholics, the most important part of Christmas decorating is the nativity set depicting the birth of Jesus Christ, the very reason for celebrating Christmas. Religious stores carry great nativity sets. 10. Christmas bazaars: Trade fairs are a good venue for finding export-quality Christmas decors from all over the Philippines. Always be on the lookout for announcements about Christmas bazaars where the products are usually sold at discounted prices. 11. Factories: If you have time to spare, you can even plan a trip to the factories of Christmas décor makers. You can browse online for factories you can visit. I recommend the Christmas Décor Producers. 12. Garage sales: Another man’s “trash” can be your “treasure.” Around Christmastime, many people do some general cleaning and decide to discard some items, including Christmas decor. Wherever you decide to buy your Christmas decors, the important thing to remember is the spirit of the season, the reason for celebrating Christmas.